Zounds! Blade dodges blows from the bad guy ... or something. Mexican director Del Toro (The Devil's Backbone) takes the reins for this followup to the successful 1998 vampire thriller, and the result is considerably better. Which isn't saying much. 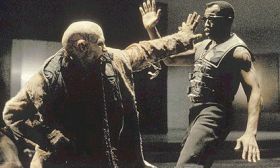 Snipes is back as the title character, a half-human/half-vamp daywalker who hunts creatures of the night with the help of a computer geek (Reedus) and Blade's grizzled partner Whistler (Kristofferson), whom he rescues in the film's opening sequence. And this time Blade must join forces with his enemies in the Blood Pack (aka, the vampire government) to fight a new threat: a breed of genetically altered super-vamps who prey on humans and vampires alike, and are threatening to take over the world in the process. The film is relentless in its nonstop action, although it does manage to create decent characters along the way, including a fanged love interest (Varela), a combative cohort (Perlman), a veiny alabaster-skinned emperor (Kretschmann) and a ruthless villain (Goss). The effects are impressive, flooding the screen with gore and doing amazing things with the baddies' extremely disturbing facial anatomy. The action scenes are also well-orchestrated--coherent and energetic. Sadly, the whole doesn't equal the sum of its parts, as the film is so loud and bombastic that it completely forgets to be either scary or suspenseful. Instead it's just noisy, grisly and very stupid. The production design is like a high school stage production of Mad Max Meets the Matrix. And once you notice a fundamental flaw in logic, it's hard to generate any intensity at all: They continually fire bigger and bigger guns at the bad guys, despite the fact that the only thing that will kill them is a well-aimed UV flashlight. Duh.